Dr. Robert Simmons is an Implant Dentist proud to offer Dental Implants in Greensburg, Elizabethtown, Columbia, Campbellsville, Russell Springs, Buffalo and all of Hart County, Kentucky. Dental Implants are small titanium "fixtures" that take the place of the natural root of the tooth and are gently implanted into the bone, using local anesthesia, these very tiny titanium roots actually bond or integrate with a patient's bone, more securely than natural root would. 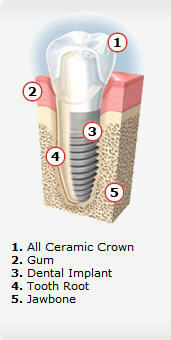 Often an osseointegrated dental implant placed by your dentist is more stable than a natural tooth's root. Upon these implants, we can build permanent teeth, custom designed and shaded to aesthetically suit each patient's distinctive facial requirements. Missing teeth have unique demands. The challenge is to replace your missing teeth with appearance and function, without harming your remaining teeth or gum tissue. Below are some common questions & answers about dental implants, please feel free to contact usto learn more about a dental implant consultation or take the time to request an appointment online. Greensburg Dental Implants - Anyone who is missing one or more teeth due to injury, disease or tooth decay may be a candidate for dental implants. The dental implant is stable and comfortable. No adjustment is needed after placement. Normally, it will serve its owner for life.